resistance to one who is evil. gaze to bear on the truth. This year is an opportune time for the worldwide Redemptorist order, but especially the order in the USA, to get back to basics outlined by their sainted founder Saint Alphonsus Liguori and beautiful example of Saint John Neumann. Why this year? Because the Church in the USA is honoring the 200th anniversary of birth of Saint John Neumann. So, it is a Year of Saint John Neumann. A recent essay on the Redemptorist spirituality by Michael Terheyden is a very fine primer on the subject. We are all called to follow the in the way of the Redeemer. order answered a question in what he saw as essential to renewal. I think the renewal is not only for the Carmelites but for all us. Don’t you think? accomplished priest who was doing his best to live the vocation he was given. The Reverend Father John F. Harvey, OSFS, 92, died yesterday. He was the founder of Courage. 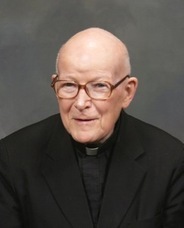 Father Harvey’s obit can be read here. A year ago, Father Harvey gave a retreat to us at St Joseph’s Seminary.